One of the pillars of the Pilates method and one of the aspects that makes it unique is the focus on articulating the spine. Lateral: bending from side to side. In order to be healthy the spine must move in all 4 of these possible ways each day. By moving the spine each of the vertebrae articulate thus decompressing it. The muscles around the spine become more flexible and the tissues better hydrated thus healthier. Articulating the spine is crucial to protecting it as it makes it that much stronger and therefore less likely to be injured and cause you pain. A Pilates session is only complete when the spine has been articulated in all 4 directions and ideally many times in various different exercises. I always end each session with a flexion exercise, the “Standing Spine Stretch,” we do a seated version of this exercise in the Mat routine but the standing version is just about the easiest exercise to do anywhere: at home, at work, on a long haul international flight or after finally putting your baby to bed after long rocking sessions! I would not survive those flights nor would I have gotten through the baby rocking phase without this exercise. This is also the first exercise I give new clients for homework, now it’s your homework too! 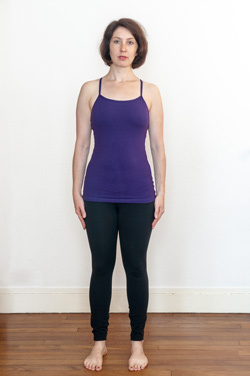 Stand with your feet parallel and hip width wide. That does not mean as wide as the outside of your hips. Your feet should be aligned with the center of each hip socket – where the femur (leg bone) enters the joint. Inhale and circle your arms up to the ceiling. Exhale and release your head downwards first, letting it feel heavy. Then continue to breathe as you let your head pull the rest of your spine downwards slowly, vertebrae by vertebrae, the 7 cervical, the 12 thoracic, the 5 lumbar. Stay down for a moment letting your head and arms dangle and continue to focus on your breath taking nice long inhales and exhales. Check the distribution of your body weight, if possible in front of a full length mirror for guidance: Are you leaning too far back? Put more weight on the balls of your feet. Are you still leaning too far back? Do you tend to hyperextend your knees (block them)? Are your hamstrings really tight? If you answered “yes” to any or all of those questions, bend your knees slightly. Imagine you are pushing the floor away from you with your feet, start with an inhale and slowly stack your spine up vertebrae by vertebrae as if you were building a tower with Legos: 5 lumbar first, then 12 thoracic, 7 cervical and finally your head. Repeat full movement 3-5 times. On your last repetition stay down for a moment, let your head dangle and be as heavy as possible. Shake your head “yes” a few times, shake your head “no” a few times, and then let it be still. Next circle your arms from your shoulder sockets gently stirring both humerus (arm bones) in one direction and then the other. Then repeat Step 4. That’s it! This simple exercise can be done any time of the day. Be aware that if you do it first thing in the morning you will feel much less flexible than if you do it later in the day. This exercise is also a great cool down stretch after ANY workout. If you have severe back and neck pain issues and the idea of diving your spine forward makes you uneasy you can do a modified version, all you need is a wall! Stand with your head and back against a wall, knees bent with feet hip width. It is as if you are sitting on a chair in midair and the wall is the chair back. Start slowly peeling your head and then your spine off the wall vertebrae by vertebrae, your arms dangle, you only go as far as you feel comfortable keeping your sacrum firmly glued to the wall. Imagine you are pushing the floor away from you with your feet and slowly stack your spine up vertebrae by vertebrae as if you were building a tower with Legos: 5 lumbar, 12 thoracic, 7 cervical and your head. Step 3: Repeat full movement 3- 5 times and add Step 5 from above on the last repetition. This simple and efficient spinal flexion exercise, when incorporated into your daily routine, can put you on the road to having a healthier more flexible spine! 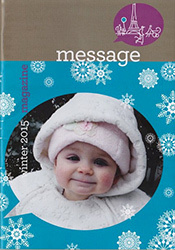 This article was written for "Message" a non-profit group for English Speaking Parents in Paris and published in its Winter 2015 Magazine.